Nice, mashallah. Love these. 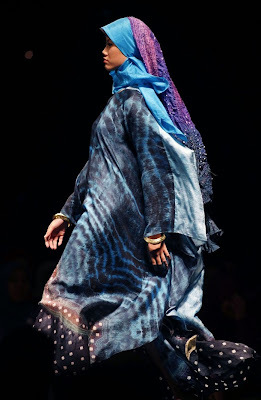 :) I know the Indonesian fashion designer named Dian Pelangi, she's one of my good friends. :D I love that girl's designs and stuff. Thank you for such nice blog Jana. Any idea where to get these and other clothes from Indonesia? I do however have one comment, in my limited knowledge I find the second pic to be inappropriate hijab as it reminds me of the hadith based on the women who were dwellers of hell, who used to hold their hair up to resemble the hump of a camel... I am not saying it is the same but I think it really is too high and fashion/cultural wear over doubt I would refuse to do. salam sis jana,i'd like to link u to my blog,its a new blog about malaysian hijabi scene.Feel free to visit. Love the bottom right...everything about it! 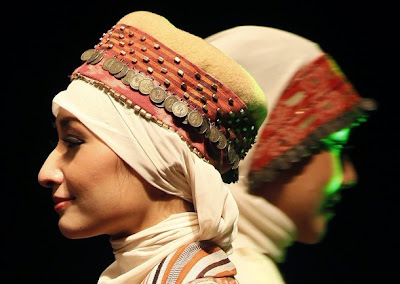 love the way the hijab is draped and the colors are amazing. would like to see how this hijab was wrapped. Oh my dear country ! The best hijab style.